Some fun Resources using Operations! This is a great little unit to learn the combination of 10! 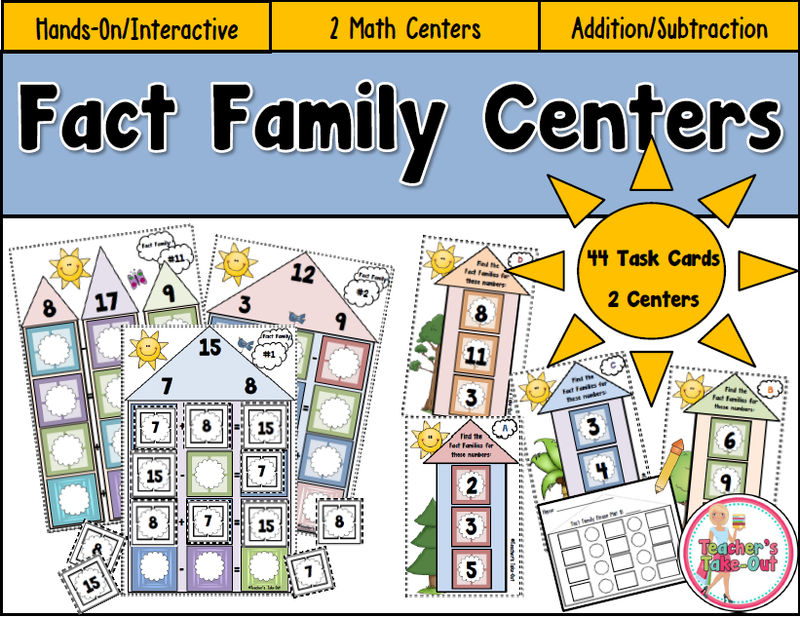 It includes over 10 centers to help learn the numbers that make 10. 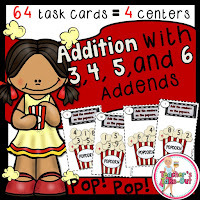 Addition with 3, 4, 5, and 6 Addends has 64 task cards. These are great for finding 10's! A fun popcorn theme is used. Fact Drills are perfect to drill those addition and subtraction skills. Save some paper too. There are a total of 32 facts on each half sheet. 70 Drills included! 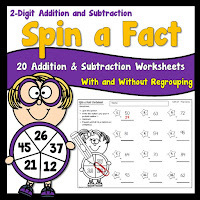 Spin a Fact has 20 worksheets that have students practicing adding and subtracting 2-digit numbers. These worksheets use grouping and no grouping. Each worksheet will have different answers each time you use them. 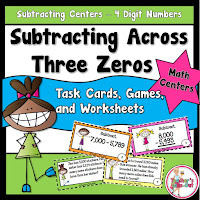 Great for additional practice and to have something fun adding and subtracting. 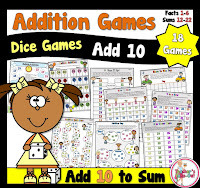 Need some addition games? This pack has 18 game boards that are used for playing with 2 dice. The game boards are kid friendly and easy to use. 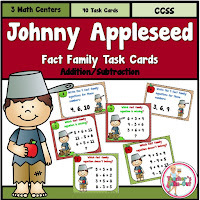 If your students are learning their addition facts, than this is the pack for you. The next set has the same games, but they add 10 more! 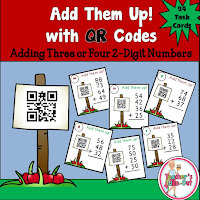 Do you use QR codes in the classroom? Try these two packs that work on addition skills. 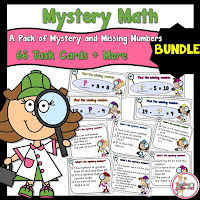 Mystery Math and Missing Numbers has some fun activities. This unit is great to integrate with your mystery unit. 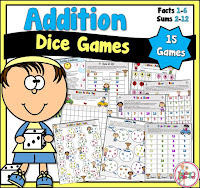 Apple Addition and Subtraction have addition or subtraction fact cards and some cool board games to use with the fact cards. These 2 packs are all about Equal Equations. 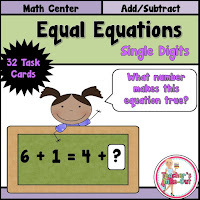 Addition and Subtraction equations with regard to the equal sign. 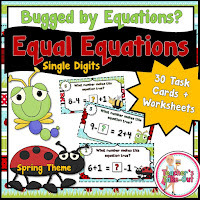 Monster Equations has 100 Task Cards using 2-Digit Numbers for Addition and Subtraction skills. These are super cute! This Monster Pack is dedicated to simple addition and subtraction facts. You can purchase each one separately or all together bundled. Subtraction Across Zeros comes in two packs. 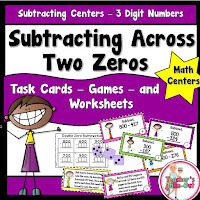 Depending on the level of your classroom, choose subtracting across two zeros or three zeros. This is always a tricky skill for many students. These packs have some fun ideas to practice this skill. Have you tried Number Ladders? They are so much fun and are perfect for number sense. There are five version available too. 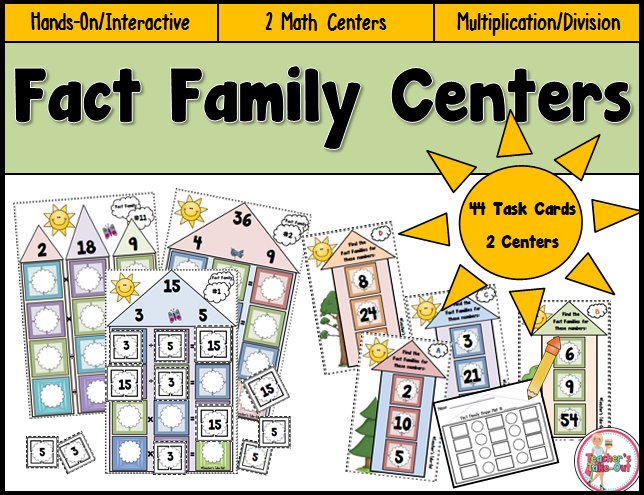 Fact Family Centers are great for Fact Families. Students build equations using a number mat to make equations and number cards. These packs come in two versions. Need some help on subtraction? How many of your students are frustrated when they subtract? Here is a fun little unit to practice subtraction with ease. Try here for a FREE trial. Get your Super Power Thinking on with these fun and engaging math games. Students use thinking and not fingers when playing these games. These are a fun twist to the traditional Bump games. For a FREE trial game board, try here. These games come in another version too, Super Zebras! Super Number Patterns has 3 math centers. 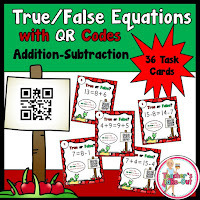 30 task cards have students finishing the pattern, 30 task cards have students finding the rule to the pattern, and 20 task cards have students finding the next number in a challenging pattern. A total of 80 task cards to practice 2-digit number patterns. This Odd/Even Pack has a few fun ideas and games to use to help students recognize Odd and Even Numbers. Need some Freebies? Try my Pinterest Board already full of Freebies! Don't forget to try here to find Teacher's Take-Out Resources at a Discounted Price!